(CNN) -- Superb centuries by Ross Taylor and Jesse Ryder were the highlights of day one of the second Test against India as New Zealand reached 351 for four at stumps in Napier. Taylor (right) and Ryder congratulate each other after their record fourth wicket stand against India. The pair put on a record fourth-wicket partnership of 271 runs to dig the home side out of a hole after a sorry start left them 23 for three early in the day, after captain Daniel Vettori won the toss and elected to bat. Taylor's 151 was just three runs shy of his highest Test score and included 26 boundaries and one six, while Ryder was unbeaten on 137 when play ended at McLean Park. James Franklin was 26 not out but was lucky to be there after surviving a caught behind appeal and seeing Yuvraj Singh drop him in the slips. The Indians suffered a setback before the Test began when captain MS Dhoni was a late withdrawal with a back problem. But they would have been buoyed by the start they had with Tim McIntosh, Martin Guptill and Jamie How all dismissed early. McIntosh was unlucky to be given caught behind off Ishant Sharma for 12 but How could have no complaints as he edged a yorker from Zaheer Khan right on to his stumps. Khan struck again at the start of his next over when Guptill tried to fend off a bouncer only to see the ball fly to gully where Virender Sehwag, taking over the captaincy duties, took a diving catch. Ryder then saw off the hat-trick ball and he and Taylor guided the Black Caps to 98 for three by lunch. 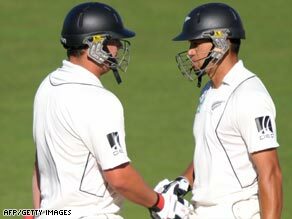 While the Indians enjoyed the upper hand in the morning session, the afternoon was dominated by New Zealand's batsmen. Taylor's 18th four helped him to his century off 151 balls before he hit another two deliveries to the ropes to guide New Zealand to 233 for three at tea. Ryder's second successive century also came with with a boundary and his 147-ball ton meant he became the first New Zealander since Nathan Astle in 1996 to score back-to-back hundreds in Tests. Taylor then brought up his 150 but in the next over he holed out to Yuvraj in the deep having added just one more run to bring to an end to a highly entertaining 204-ball innings.